To protect and conserve natural areas to enrich and engage current and future generations. 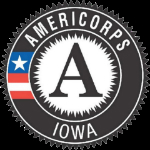 Bur Oak Land Trust doesn't solicit charitable contributions from residents of FL, NJ, NY, and PA.
Rose Danaher’s first exposure with Bur Oak Land Trust (then Johnson County Heritage Trust – JCHT) was while working on the organization’s very first Conservation Corps Iowa Crew in 2009. She worked with several property stewards on timber stand improvement and invasive species removal on the properties and also helped with the initial stocking of fish at Belgum Grove’s pond. Rose was very impressed with the passion the employees and volunteers had for the organization and feels that we’re all conservationists at heart. While each person may come from much different backgrounds, everyone has something in common: a love for the land. When not volunteering for Bur Oak Land Trust, Rose manages a water quality project in Iowa and Benton Counties called the Price Creek Watershed Project. 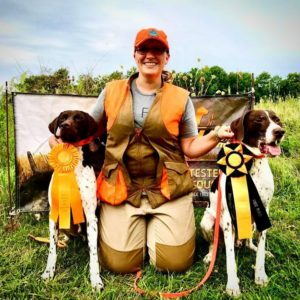 She also serves as President of the Iowa County Pheasants Forever Chapter, Vice-President of the Iowa County Farm Bureau, and is a board member of the Iowa County Conservation Board. In her spare time she manages a small cow-calf herd and hunts with her German Shorthaired Pointers, Brady and Sawyer. Last year Rose had the opportunity to attend the Land Trust Alliance Rally, the National Land Conservation Conference, where she learned a great deal and was so impressed with all the different types of land conservation taking place across the country. She was really struck by how many groups are able to work hand in hand with working farms and ranches. She feels that Iowa should take note of this, since Iowa is 97% privately owned, and 90% of Iowa’s land is used for agriculture. Rose recently helped with strategic planning for the future of Bur Oak Land Trust and at Bur Oak Land Trust’s annual fundraiser, “Under a Cider Moon…a Celebration of Autumn” where in early October she sold 50/50 tickets. Currently, she is gathering information about upcoming opportunities for stream and wetland mitigation on Bur Oak Land Trust properties. Rose feels that she has learned so much from other volunteers and loves the sense of accomplishment after a successful day. She would encourage everyone to join Bur Oak Land Trust – to connect or reconnect with the land. “You’ll meet other people who are passionate about our natural resources and feel good knowing that you’ve been a part of something that will give back for generations to come,” says Rose. Copyright © 2019 Bur Oak Land Trust. All rights reserved.